I have only ever had dogs growing up and the idea of getting a pet cat did not thrill me. However both working full time, we are unable to give a dog enough attention but really wanted a pet so after much thought and deliberation, we started looking for a cat to adopt. 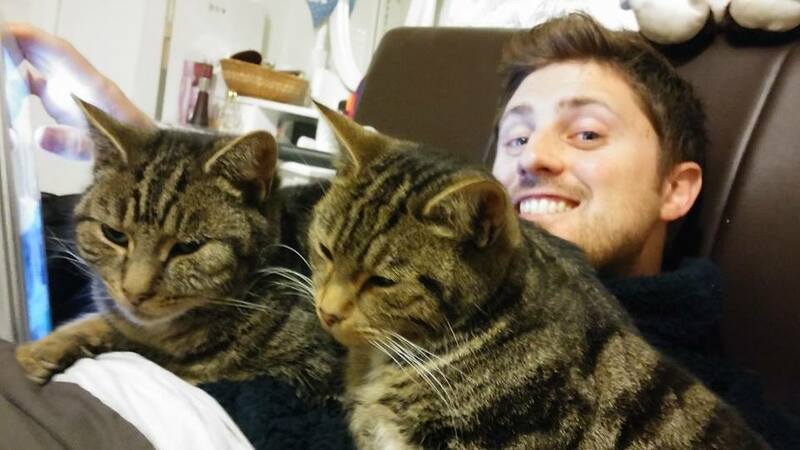 We came across an advert of two tabby brothers whose owners were relocating and were not able to take their pets with them. After asking lots of questions we decided to adopt them and become ‘parents’ to Ben cat and Jerry cat. I was on my hen do at V Festival when Chris went to pick up our new house mates from Essex and I was looking forward to meeting them when I got home, still very much undecided on whether I could become a cat person! Getting home at midnight yesterday, I crept in quietly and opened the lounge door to 4 eyes staring up at me. Both cats were a lot smaller than I imagined, considering they were 3 years old, they looked more like kittens. The one with the white socks (Ben) came over instantly and let me stroke him whilst the smaller of the two (Jerry) stayed firmly under the table. All my doubts vanished and I knew we had made a good decision. We are keeping them in for a few weeks so they get used to their new surroundings.